On the strength of a tremendous audience response to their concert in Farnham last June and a newly discovered joy in performing together on that occasion, violinist Elizabeth Cooney, pianist Grace Mo, and reader Graham Fawcett have formed themselves into the LitMus Trio and this was the Trio’s inaugural concert in Farnham. It was an exciting and wonderfully varied programme of poetry and music, as the LitMus Trio commemorate 2018’s centenaries of the deaths of Claude Debussy, the French poet Guillaume Apollinaire, and the Irish poet Dora Sigerson Shorter, and the publication of poems by Gerard Manley Hopkins and D H Lawrence, a famous passage from a classic ‘local’ poem by Keats, and W B Yeats‘ unrequited-love-inspired poetry to the legendary Maude Gonne, who was born in Tongham, near Farnham. There was music by Vivaldi, Schumann, John Field, Liszt, Ravel and Olivier Messaien, and from the Irish folk tradition, and one of the greatest poems by Walt Whitman, this year being 150 years since his work first appeared in England. 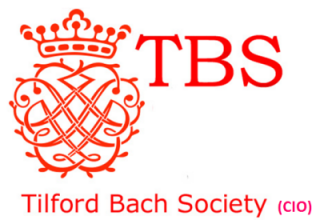 TBS was delighted to welcome some 20 pupils from Weydon School to this event. Information on the performers is at the bottom of this page. Graham studied Classics at Christ’s Hospital, Horsham, where he was fortunate to coincide with a surviving decades-long era of teaching verse composition from English poetry into Greek and Latin metres, so that the first real encounters with Shakespeare, Keats, Tennyson and others came in translating them. Graham talks about poetry to audiences in bookshops, art galleries, upstairs bars, restaurants, and inspirational old houses in England, Italy, Spain and the U.S. He broadcast on Radio 3 for twenty-five years and taught at The Poetry School from 1998 to 2015. He also devises and presents courses on writing and on literature and art, and runs lecture-performance evenings regularly in Farnham at the Bush Hotel assisted by Elizabeth Cooney. Elizabeth has emerged as one of the leading violinists of her generation, having been raised in Cork, Ireland and now living in Farnham. She studied on scholarship to the Royal College of Music, London with Itzhak Rashkovsky and having won many solo and chamber music awards there, subsequently became Junior Fellow. She performs as soloist, chamber musician and in orchestras internationally and has guest lead the Welsh National Opera orchestra, the English Chamber Orchestra, Oxford Philharmonic and the RTE Concert Orchestra among others. Described as “an excellent pianist, combining technical wizardry with impressive attention to detail”, Grace Mo is internationally acclaimed and in demand as both soloist and chamber musician. As a soloist, Grace is a prize winner of numerous international competitions and her performances have taken her to many prestigious concert venues and international music festivals around the world. Most recently she has just made her debut concert recital in Greece, and will soon be a featured artist in the concert series Les Theophanies in France.In addition to her solo career, Grace is an active chamber musician frequently collaborating with members of the London Symphony Orchestra, the Netherlands Philharmonic Orchestra and other eminent soloists. She was recently awarded the title of ‘The Best Concertmaster’ at the Rimsky-Korsakov Conservatoire in St. Petersburg for her chamber music work and musical interpretations. As an experienced accompanist, Grace regularly works with students from the leading London music colleges, including the Royal College of Music, Trinity Laban Conservatoire of Music and Dance, and Guildhall School of Music and Drama.Born in Taiwan, raised in Canada, and now living in London, Grace studied piano performance at the University of British Columbia in Vancouver and the Guildhall School of Music and Drama where she held the Leverhulme Chamber Music Fellowship, Postgraduate Piano Fellowship, and the Postgraduate Artist Diploma. Her teachers have included Joan Havill, Robert Silverman, and Holly Wang. During her studies she won many prestigious awards and grants, most notably the MBF’s Myra Hess Award, the Canada Council for the Arts Grant, and the British Columbia Arts Council’s Arts Grant. In addition, throughout the years Grace has received tremendous amount of support from The Leathersellers’ Company. Grace has taken part in various masterclasses throughout the years. She has worked with Mitsuko Uchida, Anton Kuerti, Paul Lewis, Martino Tirimo, Dominique Merlet, Gordon Nikolitch, Anner Bylsma, Philippe Cassard, Pascal Roge, Peter Donohoe, and Jacob Lateiner. As a keen promoter of musical education, she has been invited to perform for the LSO Discovery projects, as well as various educational concerts. Grace is passionate about charity work and her fundraising projects include concerts on behalf of Practical Action, as well as Leukaemia and Lymphoma Research.